Breaking Bad star, Aaron Paul, starred in a recent commercial for the Xbox One showing off the features of the console and the Kinect. During this commercial, Aaron demonstrates the voice commands of the Kinect by saying, “Xbox, on” to power up the console. This sounds insignificant enough, right? However, when he says this, it causes viewers’ Xbox Ones to turn on. 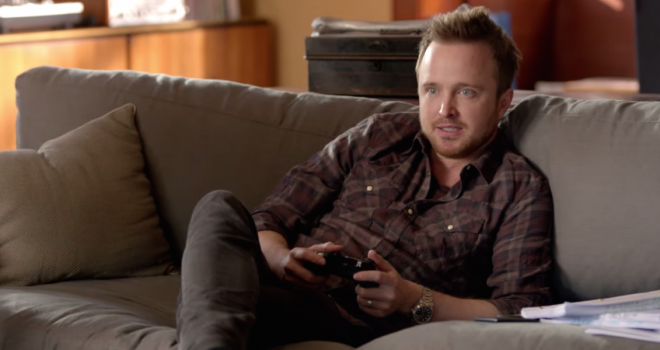 So basically, Aaron Paul is turning on random peoples’ Xbox Ones. As silly as this situation seems, it really emphasizes the poor execution of the Kinect. Using voice commands really isn’t that much more convenient than simply pushing a button. Players are going to have to pick up the controller eventually. Why not just turn the console on with the controller? As cool as voice commands seem in theory, they have proven to be unresponsive and/or inconvenient. The Kinect is pretty much dying at this point. Developers want nothing to do with it, and consumers just aren’t interested in motion controls or voice commands. It’s all been said before. The Kinect is never going to catch on and this is a good example why. Another weird thing about the advertisement, is that at the end they promote the new Kinect-less bundle for $399, but the commercial itself focused heavily on features of the Kinect; quite a weird marketing choice. If you own an Xbox One with Kinect, did you experience any problems when this commercial came on?